"The city of Kos is not great, but it is much better built than any other city, and it seems wonderful to all who pass her off to their ships." The April 23, 1933 Kos was struck by a catastrophic earthquake - measuring 6.6 on the Richter scale - which lasted only 27 seconds, but razed the city and claimed the lives of 170 people. This disaster was, however, a positive consequence: it soon appeared that most of the medieval houses of the port district were built directly on the foundations of ancient temples and marketplaces. This led to extensive excavations which was also extended to the outskirts of Kos Italian archaeologists did not have to dig far before identifying two other areas with major remnants of the ancient city. 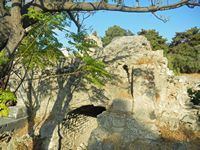 Other ancient Greco-Roman ruins are in the vicinity of the town of Kos, the famous Asclepieion located atop a hill about 3 km southwest of the city. The new town of Kos was founded in 366 BC, was organized according to the system of improved urban planning architect and planner Hippodamos which, in the words of Aristotle, invented the division of cities into blocks . This system brought regular street plan, with a grid of parallel streets intersecting at right angles, creating islets of construction (insulae). The building blocks (insulae) Kos had a width of 31-33 m and a length of about 62 m in the north of the city and 120 m in the south. The streets were 4 and 4.50 m wide, while the middle lane, which led to the Asclepieion and rural area were 33 m wide. 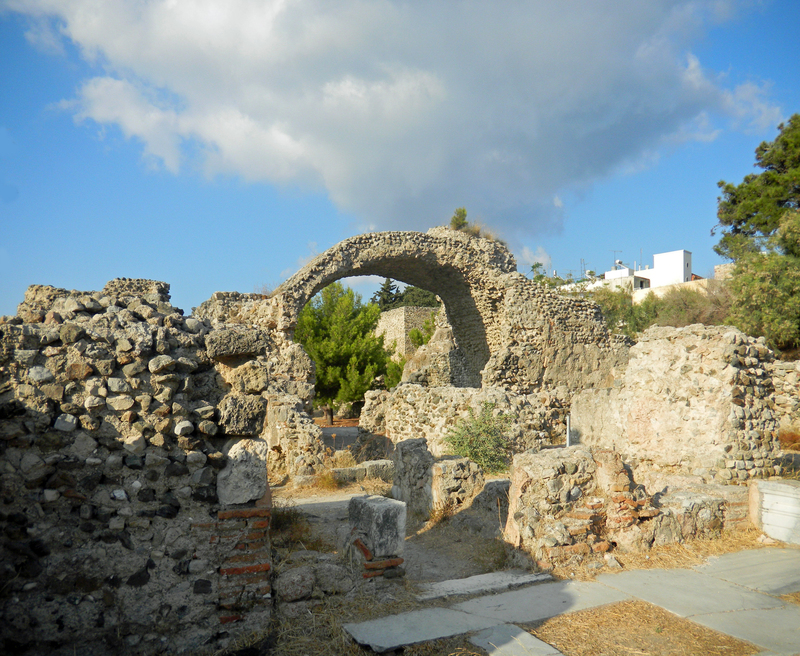 The Romans built an aqueduct from the hills south of Kos to feed the baths of the city: there were at least three bathrooms, one of which was located next to the port. The city was supplied with water by a system of clay pipes, while drainage was performed through gutters dug into the rock beneath the pavement of the streets. 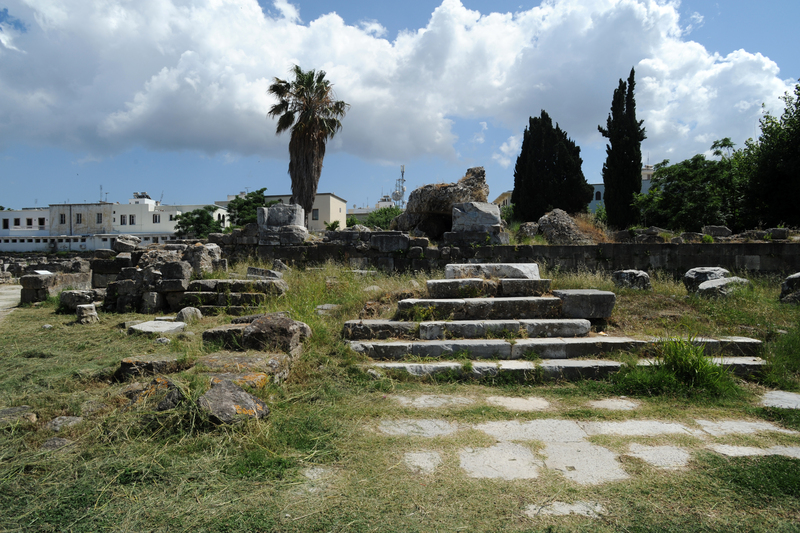 The basic structures of the city of Kos were left as is during the early Christian era (sixth century BC). 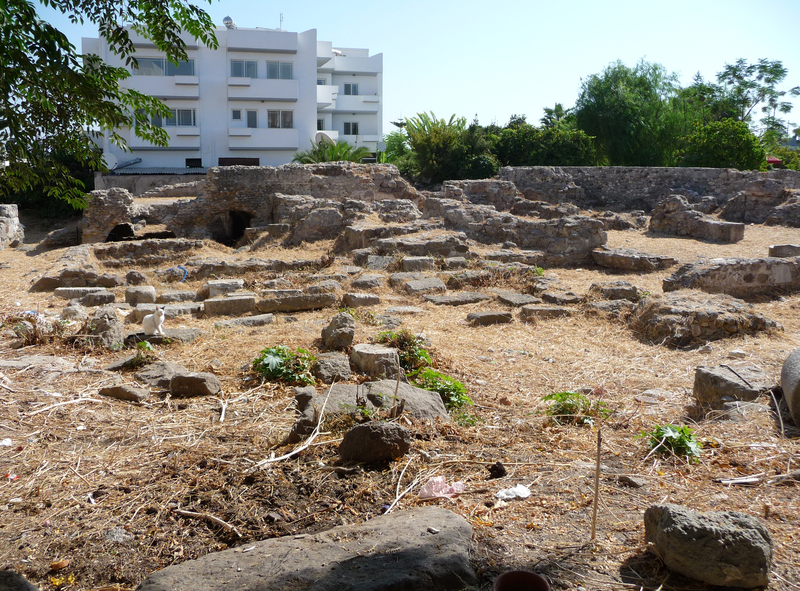 After the earthquake of 1933, which destroyed the entire city of Kos , archaeologists resurrected part of the Greco-Roman city. 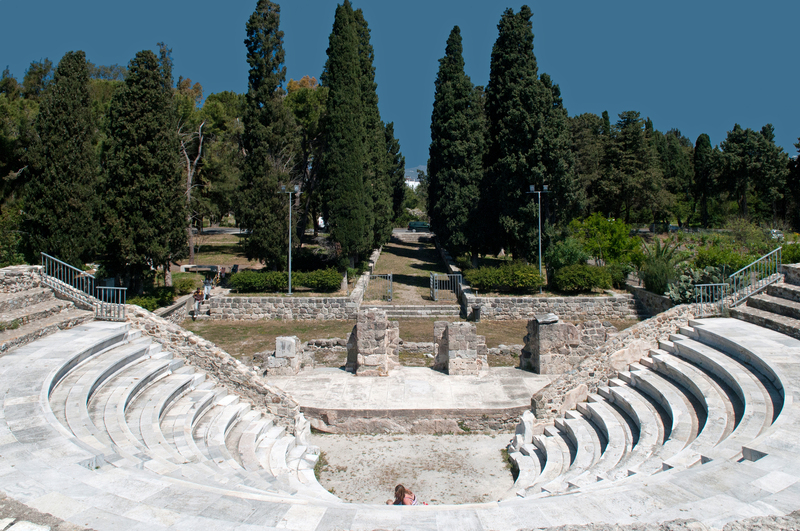 Kos is now dotted with archaeological sites such as cracks opening in the city. 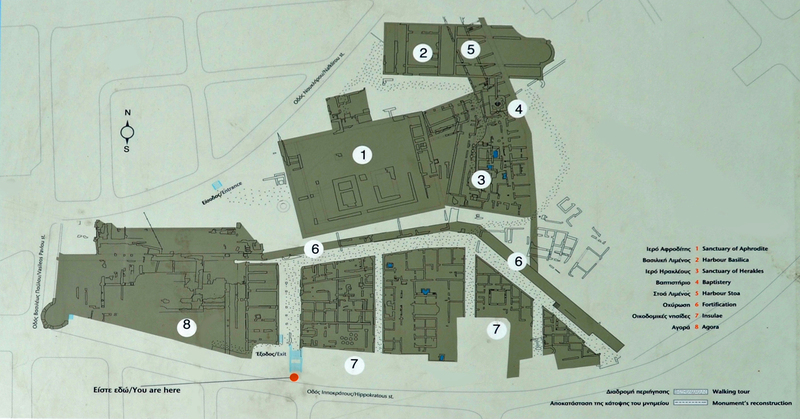 Archaeological excavations have been divided into zones: the eastern zone , the central zone and and western area . 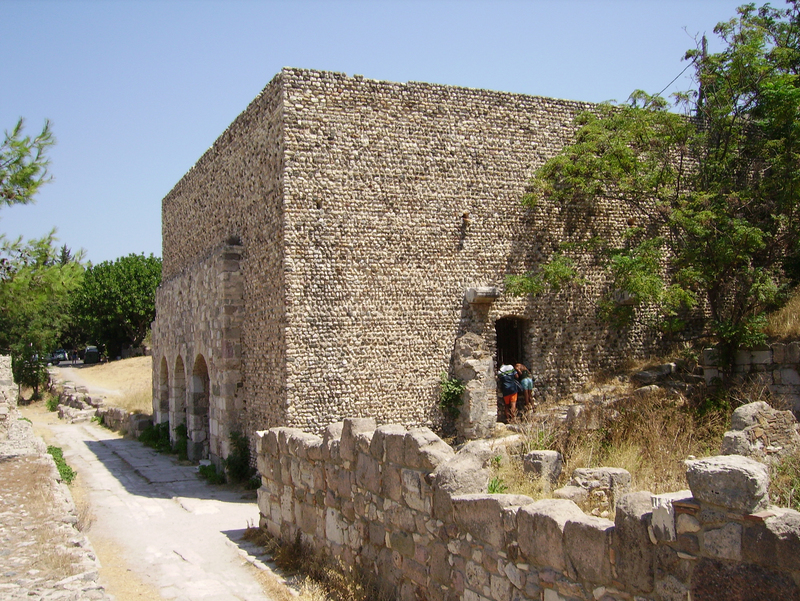 South of the Castle of the Knights Hospitallers of St. John is - connected to the castle by a bridge - Sycamore Square (πλατεία του πλατάνου) owes its name to the famous plane called "Hippocrates Plane" (πλάτανος του Ιπποκράτη) that stands in the center. According to legend, this is the famous physician Hippocrates (460-370 BC), who himself had planted to teach his disciples in the shade of its foliage. Hippocrates believed in effect, like the Greeks of today, the shadow of the plane is safer than those of all trees this tree would have almost 2400 years old. In reality, this impressive plane is much more recent: 500 years at most, that is - at best - a descendant of the plane of Hippocrates. 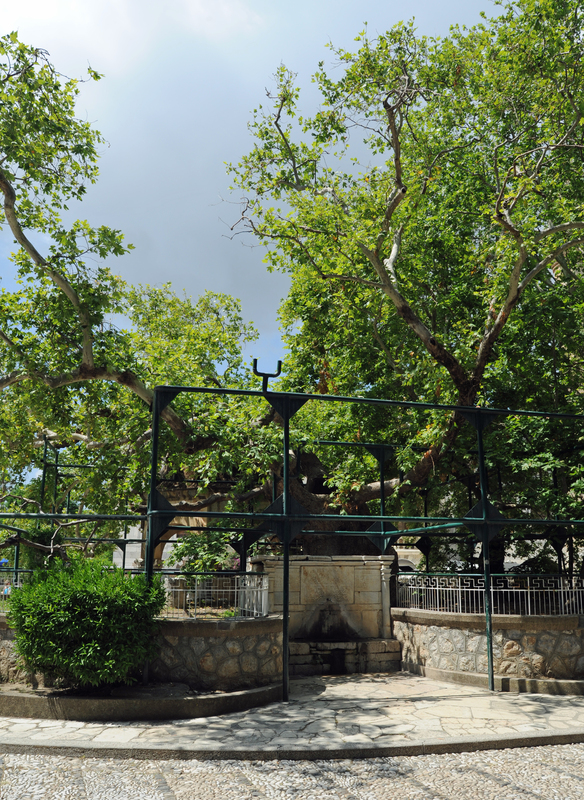 The "Hippocrates Plane" is however one of the oldest plane trees in Europe. 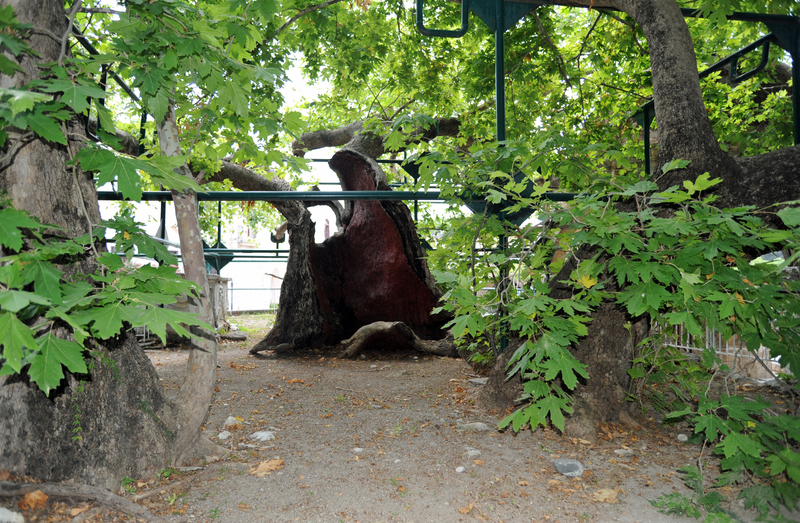 This is a huge tree - the species Oriental Planetree (Platanus orientalis) - whose hollow trunk has a circumference of 12 m, but the years have tried many and must be supported by a metal frame complex not collapse. South of the plane of Hippocrates is the Archaeological Site of East and this is an area of excavation of approximately 30,000 m² in area, located around the port of Kos, between Akti Miaouli (Ακτη Μιαουλη), the Street Nauclère (Οδός Ναυκλήρου) and Boulevard Hippocrates (Λεωφόρος Ιπποκράτους), this archaeological site is also known as the excavations of the ancient agora. This monumental complex began in the port area, abutting on the fortification wall, and ended at the central artery of the city, which was about 33 meters wide and led to the Asclepion . The site was later occupied by the old medieval town called Lango. 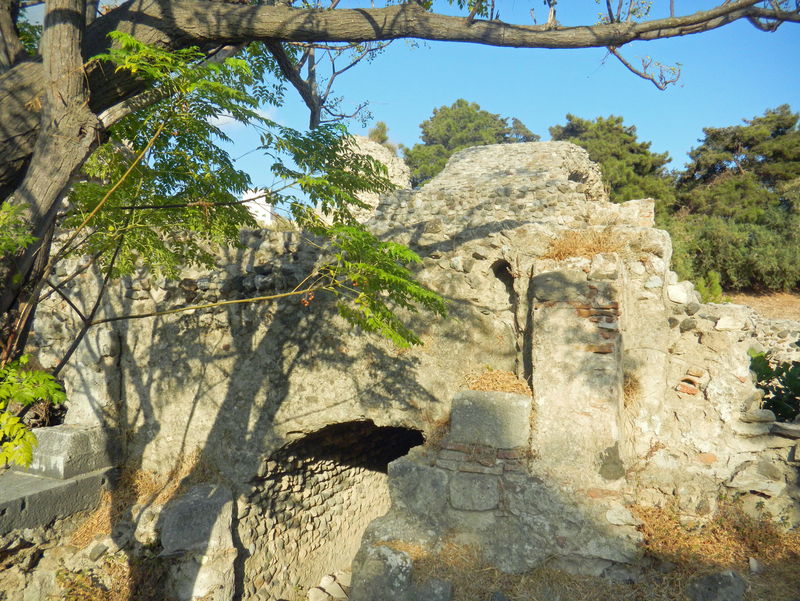 During the earthquake of 23 April 1933, the area that suffers the worst damage, including the Italian Archaeological Service carried out excavations depth between 1934 and 1942, revealing much of the ancient city, mainly Hellenistic and Late Antiquity. The harbor area included shrines and public buildings: the double temple of Aphrodite , the temple of Heracles , the shrine of a deity unknown, stoa port , the port basilica with the baptistery, and a large part of the urban fabric of the city and part of the wall with fortified towers. The study of monuments revealed three phases of construction, covering the period from the late fourth century to the early third century BC until the year 469 or 554 AD, when the agora was destroyed by an earthquake. The earthquake in the year 142 caused extensive damage to the area of ​​the agora and major repairs and reconstruction work was undertaken immediately after the earthquake. Following the complete destruction of the city wall, the north wall of the complex was remodeled, with the sanctuary of Aphrodite at hand, and to the east, creating an architectural ensemble which aroused the admiration of visitors , especially those who arrived through the port. 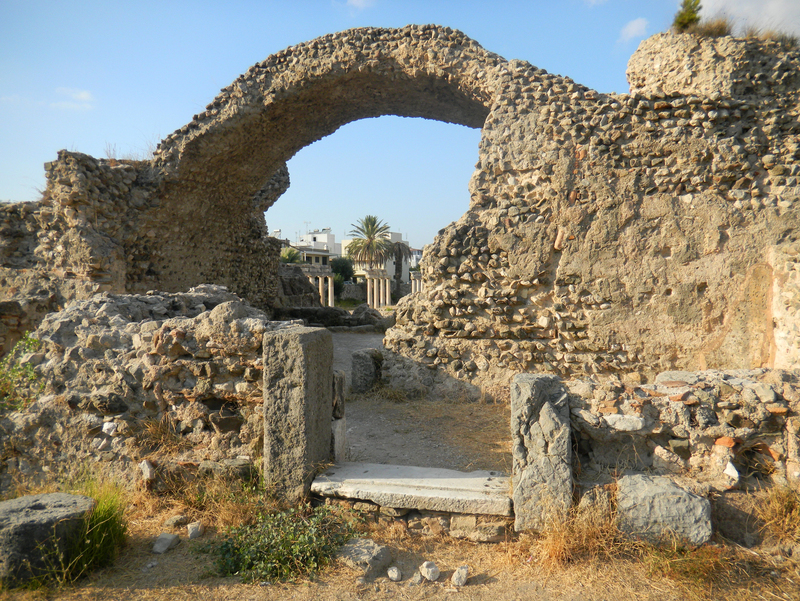 Following these changes, the northern part of the agora of the second century AD also served as a place of worship. What is called the portico (stoa) port was built in abutment against the pier of the harbor, in the fourth or third century BC. We can distinguish two phases of construction: originally it contained 31 rooms, in front of which was a double colonnade of Doric colonnade being composed of 16 external composite columns. This impressive double colonnade was 50 m in length. All that remains on site of this first phase is the lower part of the walls, while parts of épistyles colonnades were identified on the archaeological site. In Roman times, the stoa was severely damaged at the end of the third century AD, probably due to an earthquake, which required major repairs and alterations. 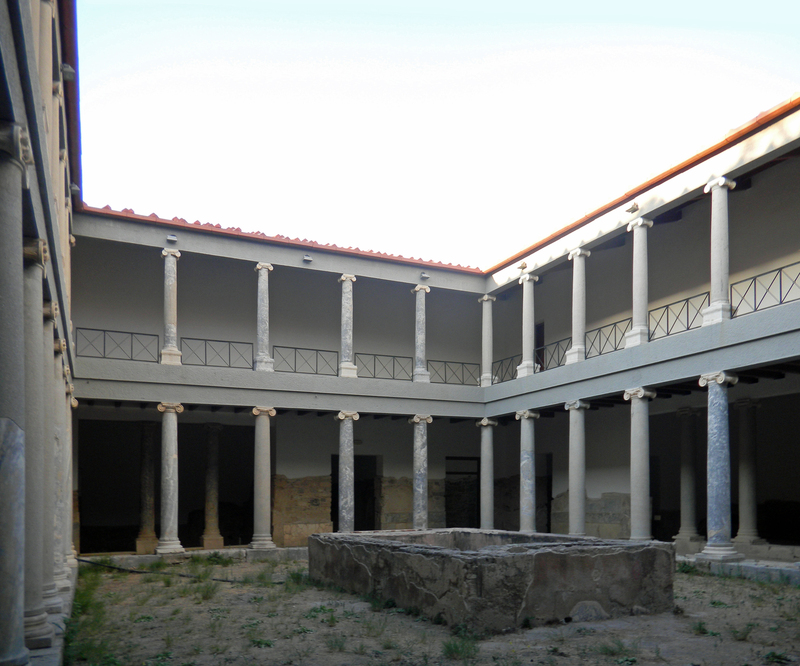 The new building was two floors with arches and Doric columns were replaced by monolithic columns of Corinthian marble cipolin, the use of marble columns cipolin the island of Evia is typical of the period of the Emperor Hadrian. The stoa was destroyed by another earthquake, the year 469 AD, and on its ruins the port basilica and baptistry were built in the fifth or sixth century. The portico there are eight Corinthian columns. This double temple of the Corinthian order, was dedicated to the goddess Aphrodite in its function of sea goddess, Aphrodite Pontia, and its function as the goddess of love vulgar Aphrodite Pandemos. Temple there remains only the Propylaea and two fragments of columns. Dominating the center of the portico (stoa) was the temple of Heracles (Hercules) - the third century BC - a porch with six Corinthian columns. The temple was richly decorated with floral and geometric motifs, while the abacus of the capitals of the columns were decorated with figures of winged Eros. The front of the room on the courtyard was converted into nymphaeum. Each side of the room were covered entries semi-cylindrical vaults, built in opus caementicium (cement) and plastered with curved meander patterns. The two lateral arches led to the portico of the agora, and the vault of the medium agora. Architectural elements survivors propylaeum are now gathered in the west of the stairs. 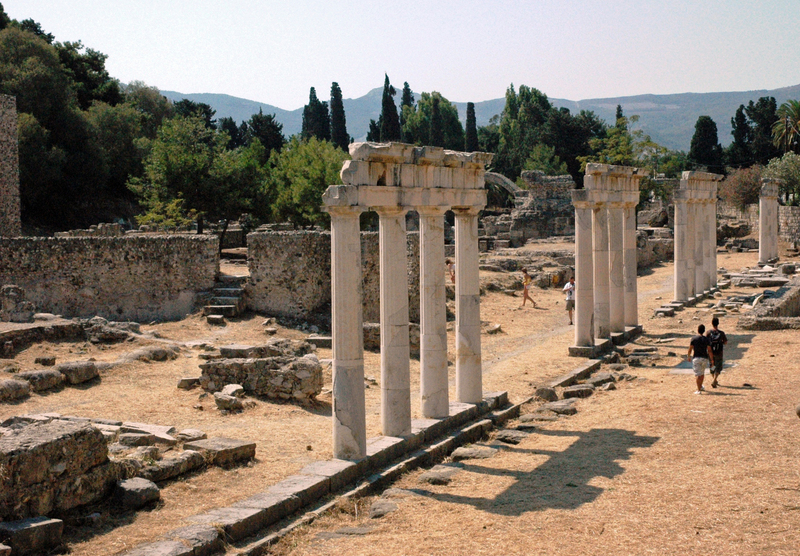 The remains of the temple of Heracles include some Corinthian columns. The temple of Hercules was perhaps dedicated to the worship of the emperor, a supposition which is strengthened by the discovery here of a part of a colossal statue - about 3 m - a male character. 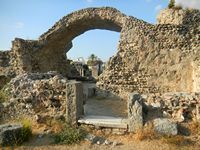 In this way, the inhabitants of Kos wanted to express their gratitude to the Emperor Antoninus Pius (86-161 AD), who helped to repair the damage caused by the earthquake of 142 AD - C.. 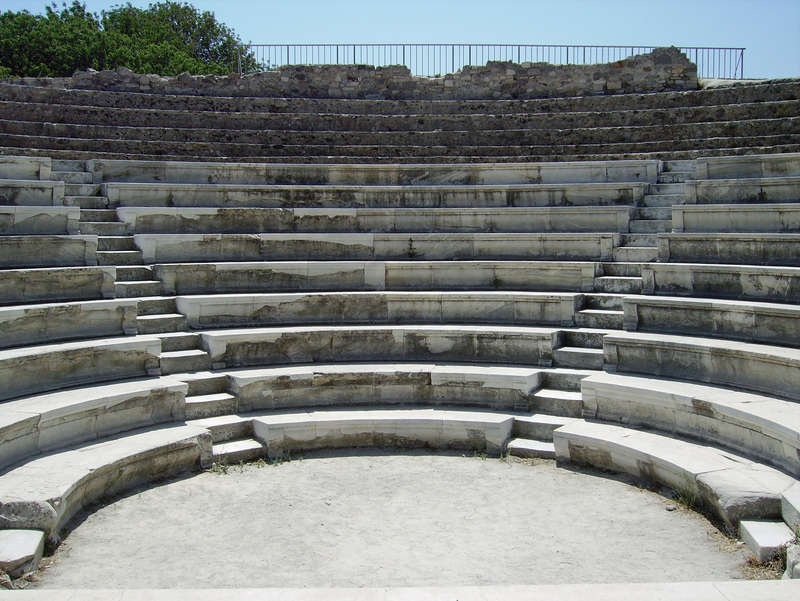 The ancient city of Kos was protected immediately after its foundation in 366 BC by a circular enclosure walls 1 to 1.5 km in diameter and 3 km in circumference. This chamber was 5 m thick and 2.5 m in height it consisted of two walls of coarse blocks of stone with a rubble filling between the two walls. The wall was strengthened by semicircular towers and polygonal, five of which have been discovered to date. Stairs gave access to a walkway and another road, 6 m wide, ran along the inside of the wall. 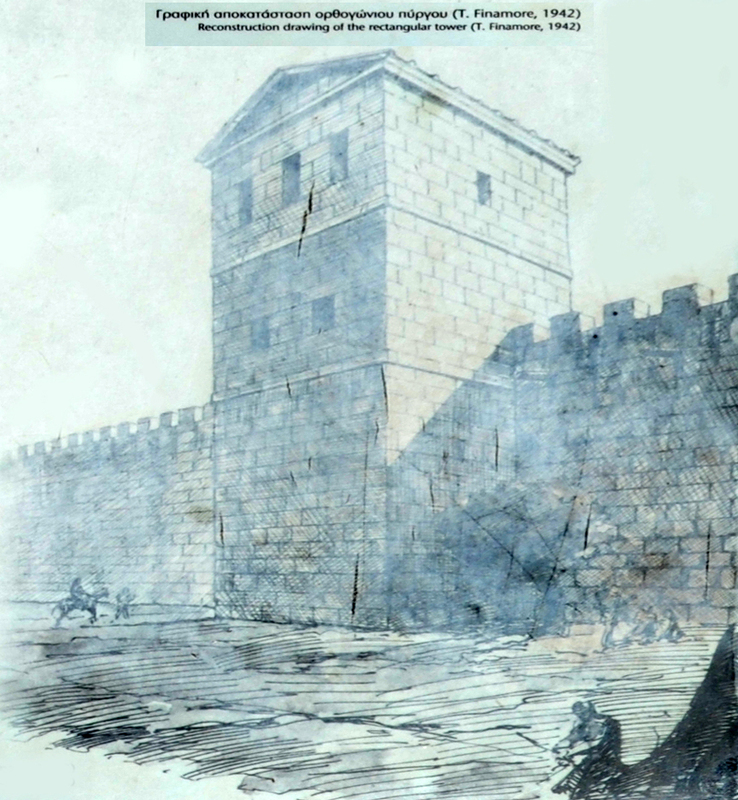 The enclosure protects the residential area and the agora , and buildings necessary for the operation of the port, as well as temples - which faced the harbor - were outside the wall. The north side of the wall described a zigzag line that followed the coast at a distance. Much of the northern section of wall was discovered in the port area during excavations after the earthquake of 1933. The Wall is the best preserved on the east end, over a length of 80 m and a staircase leading to the walkway is visible as well as traces of a rectangular tower defense protecting the door. At a later time, the tower was replaced by a semi-circular tower. The original square tower, whose foundations had only been preserved, was rebuilt in the 1930s by Italian archaeologists. 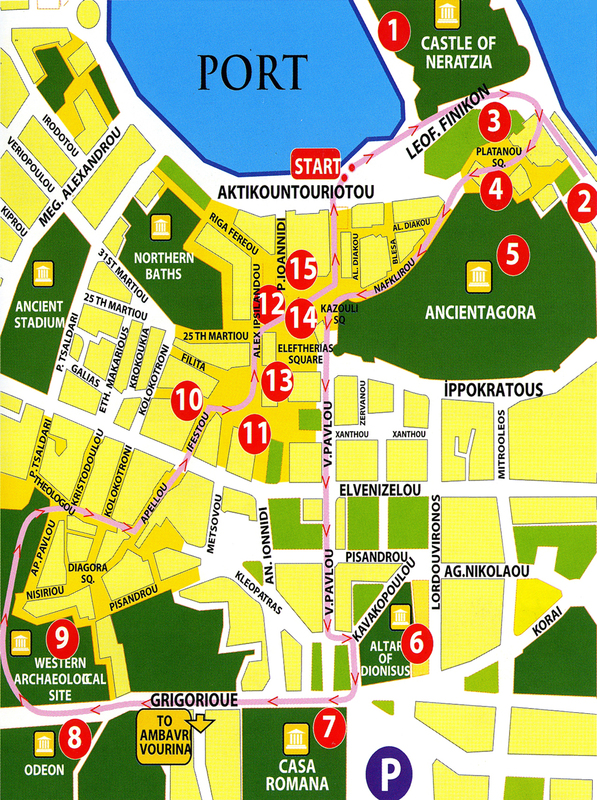 The agora of the port area dates from the Hellenistic period in the fourth century BC, it was a great market place - about 180 m by 80 m - built next to the port facilitate trade. The agora was also the political center of the ancient city, located near the stoa port and temples of Aphrodite and Heracles. The agora was used as a location in a small church of the fifteenth century, the Church of St. Constantine (Agios Konstantinos). The population of the city during the Hellenistic period was approximately 300 families (3,000 people, counting slaves). Each island (insula) could contain four two-storey homes, each covering a land area of 410 m². The unusually large size of the houses indicates that they were designed to cover the needs of a city market, like the neighboring cities of Halicarnassus and Rhodes . In the island (insula) number 1, five residential phases have been identified, dating from the foundation of the city until the beginning of the Christian era. 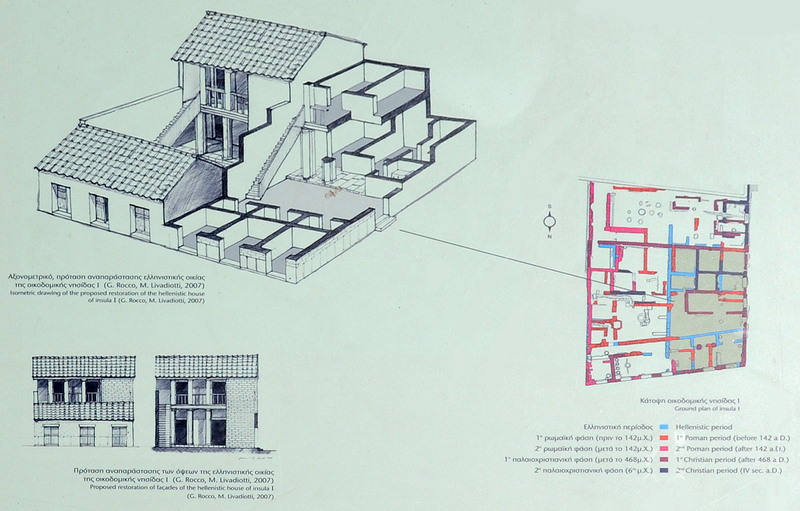 In its northwestern part, a Hellenistic house was investigated, whose plan is similar houses Hellenistic Priene in Anatolia and Thrace Abdera. This study revealed the trifunctional division of the house into three areas: a residential area, a courtyard and a space dedicated to economic activity. On the north side there was a row of three shops, including the entrance facing the street. 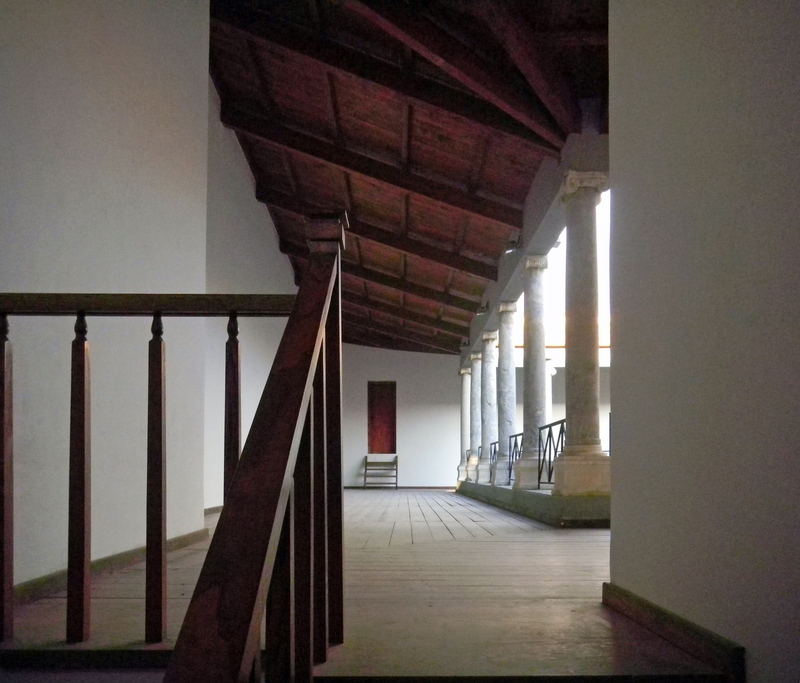 Then there was the house itself, organized on two floors and a total area of ​​150 m² (75 m² on each floor). There were three rooms on the ground floor: a meeting room (Andron) with layers, with an anteroom near the entrance, a guest room (Xenonas) with reception area and lounge family (oikos) where there was a fireplace (hestia). The last two pieces shared a covered vestibule (prostas). On the upper floor were the bedrooms and neighborhoods of the hostess (gynaikonites). In the southernmost part of the island a large door of a house in the early Christian period was found in good condition. Leaving the west side of the agora and following Vasileos Pavlou Avenue (οδός Βασίλειος Παύλου) south towards the area Seraglio (harem) and Avenue Grigoriou, one arrives at the archaeological site whose center major monuments are found the altar of Dionysus and the Roman House (Casa Romana). The altar of Dionysus is a good example of an altar shaped Π of the Hellenistic period. The best preserved part is dated second century BC, a period of growth for Kos, as attested by numerous architectural remains. It is believed that the altar was commissioned by the king of Pergamon in Anatolia, a city allied Kos . The monument was destroyed in the massive earthquake of 142 BC. After the earthquake, the locals began gradually to restore the temple and the altar. Later, during the Byzantine period , the altar was abandoned, and when the Knights of the Order of St. John , conquered the island of Kos , they used certain architectural elements for the construction of the castle Neratzia . The frieze of the altar, dating from the late second century BC, is now kept inside the castle. It depicts scenes of war and a troop of Amazons Dionysos, maenads and with satyrs. Casa Romana(Κάζα Ρομάνα) is located at the corner of avenues Vasileos Pavlou and Grigoriou always Pémptou. In the ancient city of Kos, the "Roman House" occupied a prominent: it was indeed on the south side of the main street through the city from east to west, the decumanus maximus, close to the thermal central (the baths west ), and a short distance from the southern end of the antique market ( agora ) of Kos. Casa Romana is a Roman residence which was brought to light after the devastating earthquake that struck the island of Kos 23 April 1933. The ruins were excavated between 1934 and 1936 by the Italian archaeologist Luciano Laurenzi, who named the building "Casa Romana", the name by which he is known to this day. After completion of the excavation, the residence was largely reconstructed from 1938 to 1940, according to the standards of the time, with a concrete structure. Casa Romana had been built on the ruins of earlier buildings of the Hellenistic period. The walls belonging to this prior construction can still be seen on the lower portions of the outer sides of the building. In the second century BC, most likely after the destructive earthquake of 142, Casa Romana acquired the characteristics that we see today all buildings prior periods were collected and reconstructed to form a luxurious residence occupying an entire block building (insula). This residence became the property of a family belonging to the wealthy aristocracy of the island of Kos . 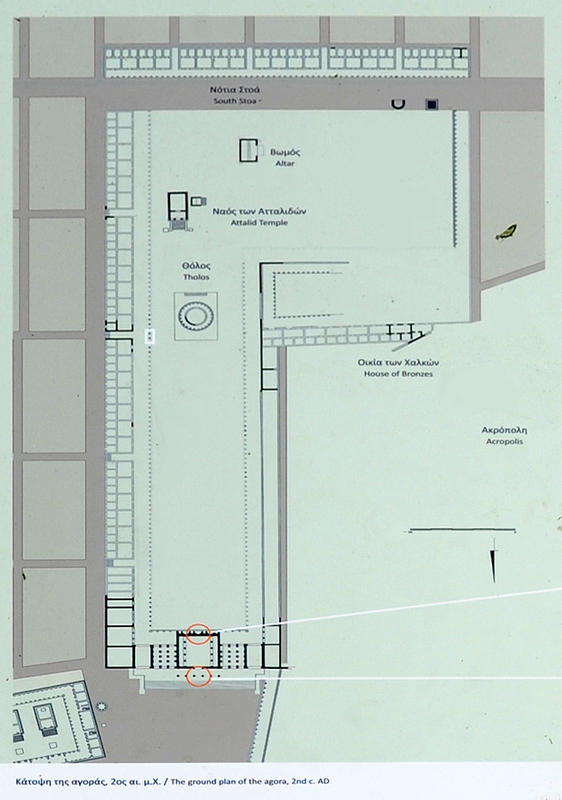 It covered a total area of ​​2 300 m² and containing more than 37 parts, which is the largest Roman villa in Greece. Casa Romana gives an idea of spacious elegance that the rich people of Kos could aspire. the atrium is included a single atrium with a floor covered with mosaics depicting a lion attacking a goat and a lion attacking a deer, an adjacent room had a mosaic of marine animals. 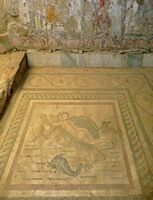 the atrium of the West was surrounded by a peristyle type Rhodian and had walls covered with marble, it included in its center a basin surrounded by a mosaic depicting dolphins and a sea-nymph riding a sea monster’s head horse. the atrium of the north, the largest, had the most magnificent peristyle: a double colonnade colonnade supporting a balcony. This combination of marble and water basins was that the house remains cool inside even during the hottest days. Rooms for the reception of the guests were arranged around these courses, the floors were covered with slabs of marble or sumptuous mosaics, and the walls were covered with marble slabs, a sign of great wealth. An important element in the decoration of the residence was a small group of statues, dating from the second to first century BC, and now on display at the Archaeological Museum of Kos . Sculptures, including themes suggested the creation of an artificial world built in the natural (nymphs half naked sitting on a rock, a satyr, Cupid, Aphrodite, et cetera), Were used for the decoration of the peristyle residence; they gave their owner the aura of an art collector, proclaiming his high social status. Private spaces are not frills, although their design does not take into account the elements of a flamboyant ostentation. These are the areas west of the peristyle, around a hall that opened onto the porch, it was private rooms decorated with plant motifs murals, or, in the case of another room, representation of Cupid. Finally, the residence has other parts to service function, like the play, in the north-east corner of the house, which was the laundry tubs with marble and carved into a drainage system, or parts the west coast, which were equipped with an oven. "Casa Romana" was destroyed by a powerful earthquake, perhaps that of 465 AD, which marked the end of the ancient world, it was never inhabited again, except for its southern part - which was not included in the building restored by the Italians. This part of the residence included areas of modest dimensions that had not any luxurious character, reflecting the social changes that had occurred. During World War II, Casa Romana was used as a hospital by the Italians could still see the red crosses painted on the outside to deter Anglo-American bombing. 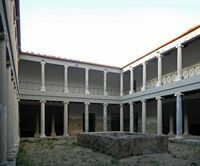 The restoration of the 1930s had already begun to deteriorate and the Casa Romana was closed to the public from 2005 to 2009 for major renovations. Opening hours: daily except Mondays, from 8 h 30 to 15 h.
Casa Romana is signposted as "House restored Kos, third century AD". The archaeological site of the west is 500 m south of the Mandraki harbor , this is achieved by taking Pavlou Avenue then turn right onto Avenue E. Grigoriou - That is to say, the avenue of Patriarch Gregory V(Λεωφόρος Πατριάρχου Γρηγορίου Πέμπτου). This open access area - still under excavation - includes a large part of the ancient city built around two Roman roads traditional Roman city: the cardinal axis, the cardo, crossed at right angles by the decumanus maximus . 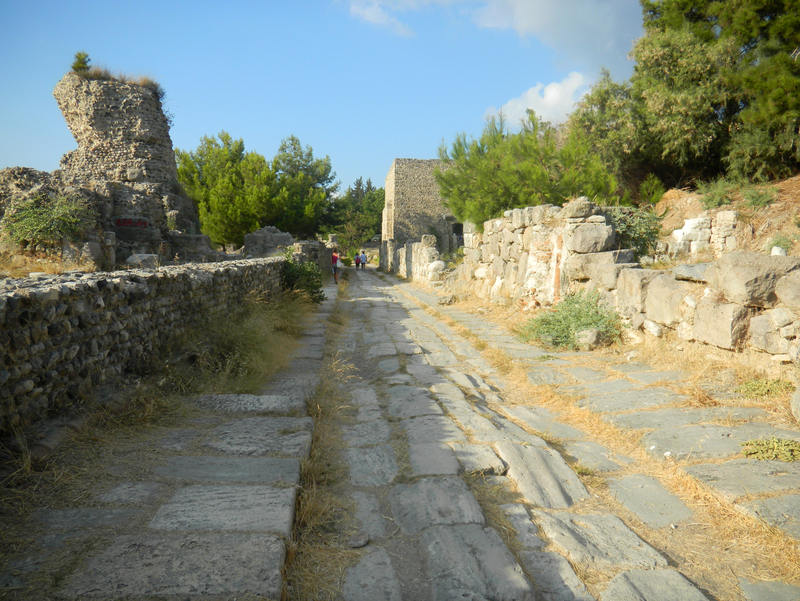 Decumanus is still visible on the right side of the street Grigoriou: it was a paved width of 10.5 meters, with wide sidewalks, which was lined with arcades, one can notice the traces on the pavement made ​​by the wheels of Roman chariots. This vast area includes the remains of most of the buildings that were found in a Roman city: public latrines reconstructed by archaeologists - that we first took a Nymphaeum - of Roman houses which were adorned with sumptuous mosaics and murals, Roman baths , an odeon , a gymnasium and a stadium . Under the two main tracks was a complex system of drainage ensuring sanitation of the city. To the right of Nymphaeum is - under a protective roof - a mosaic representing the "Judgment of Paris" Pâris had to decide which of the three goddesses Athena, Hera and Aphrodite was the most beautiful: Pâris thought it was Aphrodite. The ruins of a baptistery of the Byzantine period is also located in this area, south of Avenue Gregory V, near the Odeon . To the east of the cardo of the ancient city is an elegant restored building dating from the third century BC. The monument is surrounded by eleven columns of white marble, with three niches and a swimming pool in front of each of them. When this building was discovered, its elegance led archaeologists to the conclusion that it was a Nymphaeum, that is to say, a shrine dedicated to the nymphs. A Nymphaeum, in Greek antiquities (νυμφαιον) and Roman (nymphaeum), was a monument dedicated to the nymphs, especially nymphs sources. These monuments were originally natural grottoes, which tradition considered the home of the local nymphs, these caves were sometimes constructed as to provide a water supply. Artificial caves later replaced natural caves. We now consider that the building was actually a luxury public urinal or latrine. Grigoriou down the avenue to the west, can be seen on the right - north of decumanus - shelters of wood: they protect the ruins of the "House of Europe". This monument owes its name to the remarkable mosaic depicting the abduction of Europe (Ευρώπη) by the god Zeus (Ζευς) under the guise of a bull Europe hangs naked neck and flank of the animal. 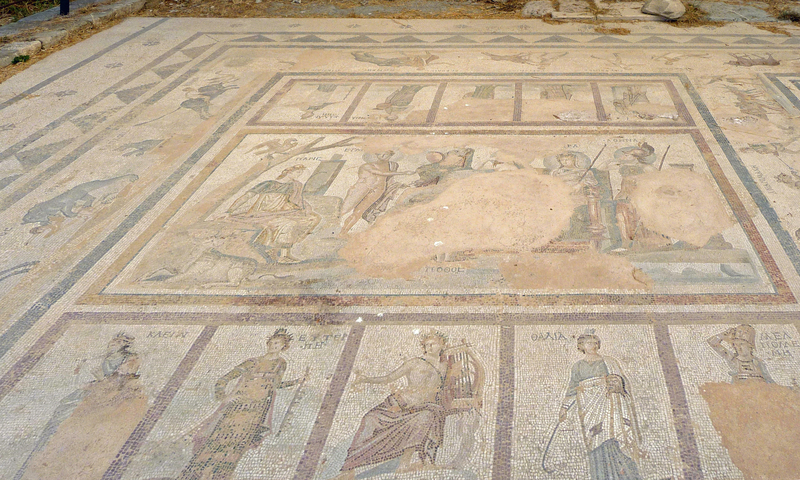 Mosaic adorns the floor of a small room on the left side of the court. Many statues were found in the ruins of this house whose original construction dates back to the late third century and early second century BC, that among these statuettes those of Aesculapius / Asklepios (Ασκληπιός) of Diana / Artemis (Άρτεμις) and Salus / Hygieia (Hygieia,Υγιεία), as can be seen in the Archaeological Museum of Kos . On the left side of the Avenue Gregory V - in front of the gym , and west of the Casa Romana - is the Odeon of Kos, a short avenue of cypresses leads from the avenue to the Odeon Grigoriou (Ωδείο). Odeons were the musical theater which was used for performances of music and poetry. The Odeon of Kos date of the Roman period, it was built in the second century AD. It is small but very beautiful. 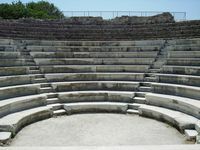 The Odeon is oriented north-south, with the auditorium (the "koilon" Greeks or the "cavea" Romans) located to the south and the orchestra and the stage in the north. 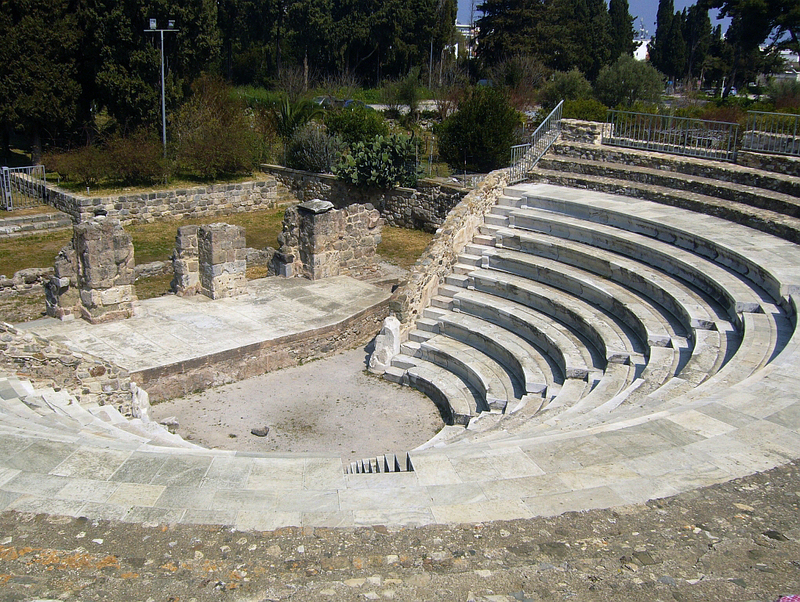 The "koilon" could accommodate an audience of 750 people: it included a lower diazoma fourteen rows of marble seats - of which only nine were restored in 1999 - for the notables, and diazoma top five steps for granite stone spectators ordinary diazoma two were separated by a landing, four stairs divided the lower diazoma. The "koilon" was covered by a vaulted roof supported by four walls and reinforced by pillars. Under the bleachers were two semicircular galleries and several smaller rooms - perhaps workshops - where was discovered the famous statue of Hippocrates, who is now at the Archaeological Museum of Kos . The scene was irregular pentagonal shape with a proscenium (proscenium) and wings, and behind the scene rectangle. The orchestra was circular, with a diameter of 5 m, and decorated with marble inlay. 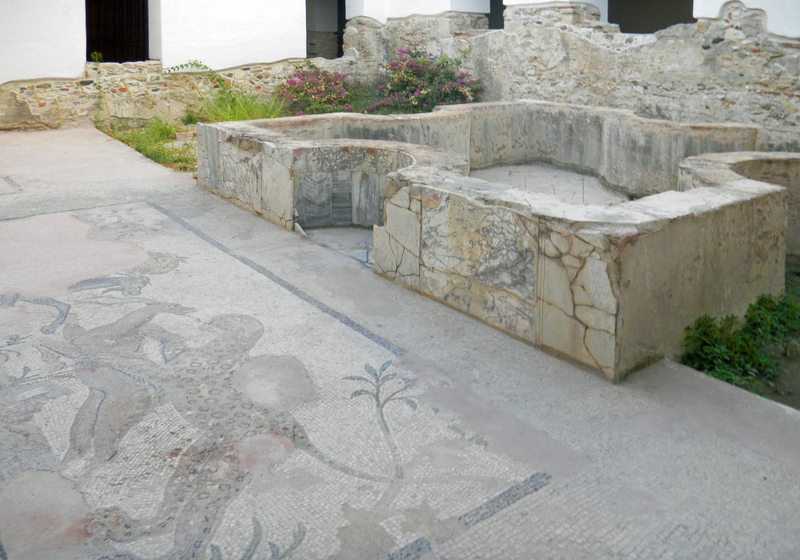 Two entrances, decorated with beautiful mosaic floors were discovered at the ends of the stage. Several statues, located in niches, decorated arches. 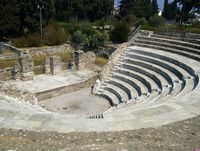 The Odeon was also the seat of gerousia (gerousia,Γερουσία), or the Senate, the public authority Kos, who had no political power, but who watched the awarding honors to prominent citizens of the island of Kos. The earthquake of the year 142 caused significant damage to the Odeon, the roof collapsed, repairs were made during the reign of Antoninus Pius (138-161 AD - C.). The ruins of the Odeon were unearthed in the excavations conducted in 1929 by Italian archaeologists. The theater has been restored by the Italians in 1934. The entrance to the Odeon is free. From the house of the abduction of Europa section of the main line of the Roman city, the decumanus maximus, is clearly visible and is parallel to the avenue Grigoriou. This paved Roman road leads beyond the ruins of a Christian basilica, the baths to the west, the recognizable remains of a domed room that covered a vast mosaic. The baths of the west were fed by the source Vourina, praised by Theocritus. The archaeological site includes a gymnasium west - or, more precisely, a palaestra - Hellenistic period, to the right of the avenue Grigoriou and near the stage which it was separated by a narrow road. A portico, consisting of a row of 17 Doric columns restored, offers an impressive spectacle, the portico of the gymnasium originally had 24 columns. The gym was known as the "Xysto"(Ξυστό) due to the habit of scraping athletes (xisoun) their bodies to clean oil smeared before they drive or departure of races. There was a pool of water in the middle of the gymnasium where athletes could wash, the baths were adjacent to the north for the same reason. The ruins of the old stadium - 200 m long by 120 m wide - have been discovered in southwest baths north along the street Tsaldari, the well-preserved remains of a aphesis (starting gate races) are still visible. Road at Tsaldari north-east, we arrive at the spa from the north. The baths were discovered north along the rue du 31 Mars (Martiou)(οδός 31ης Μαρτίου) the Greco-Roman baths dating from between the fourth century and the third century BC. The baths were port consists of a circular room with porticos, the ruins of the Baths port located at the corner of Homer Street (οδός Ομήρου) and street Herodotus (οδός Ηροδότου). 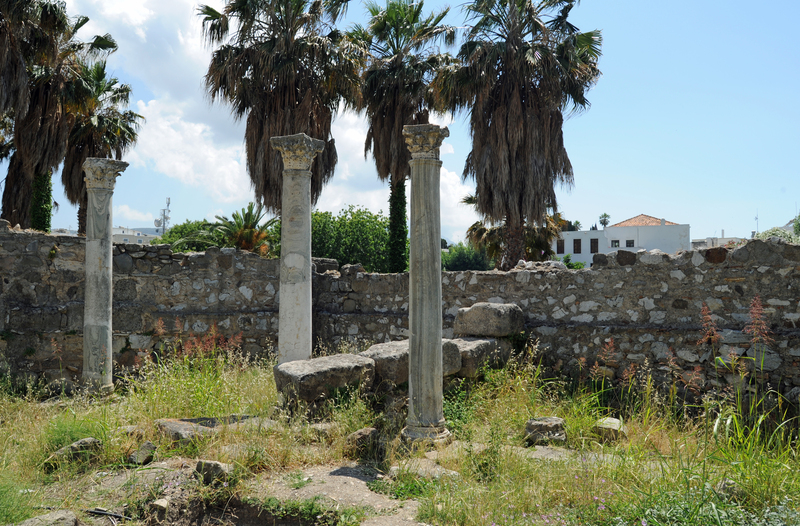 Go to page History of Kos in Greek antiquity . Go to page History Kos under the Roman Empire . Hippocrates, the "Father of Medicine", was born in 460 BC to Kos and would have studied medicine under the instruction of the "Father of Physics" Democritus. Having traveled extensively in Greece, Hippocrates then spent much of his life to Kos where he practiced and taught medicine.